The baby wants breakfast so Malcolm gets out of bed to get started. Then in comes Toby. And Una and Toto, then Alice—they’re hungry too. And Conrad from next door and his sister Ruby! Everyone has a request for breakfast. But who is taking notice of the baby? 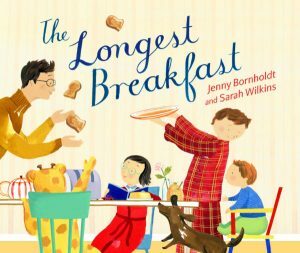 The Longest Breakfast is a fun stroy full of comings and goings with a lovely baby at the centre.